There have been 430 images uploaded to this topic. (View topic image gallery). There are 1723 posts in this topic. You are on page 34 of 35. One thing that I think would have been great on Roadshow would have been a video mode where you are driving the dozer down a street? 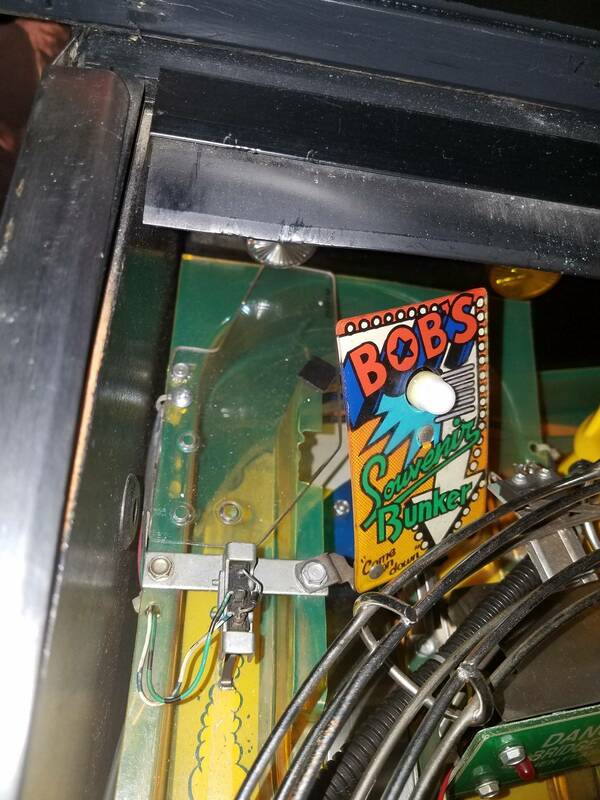 There should definitely be some kind of big reward and some kind of DMD celebration when you manage to hit Red at start of multiball with all three balls in a row coming out of Bob's bunker. This would be very very satisfying as it's very hard to achieve. Same or even bigger with shooting into Red's mouth. I own RS for about 5 years now and only managed to shoot into it for maybe 1 or 2 times! You know. I really like these sort of things. The subtle feedback from the game for special achivements. But like you said. Once in five years. That is sugar on top. Pulling out the heads today, mine are filthy! Just bought a bunch of new parts on Marco to bring them back to 100%! It's a little overwhelming at first, but they're really not that bad, just a little tight inside. Good luck. 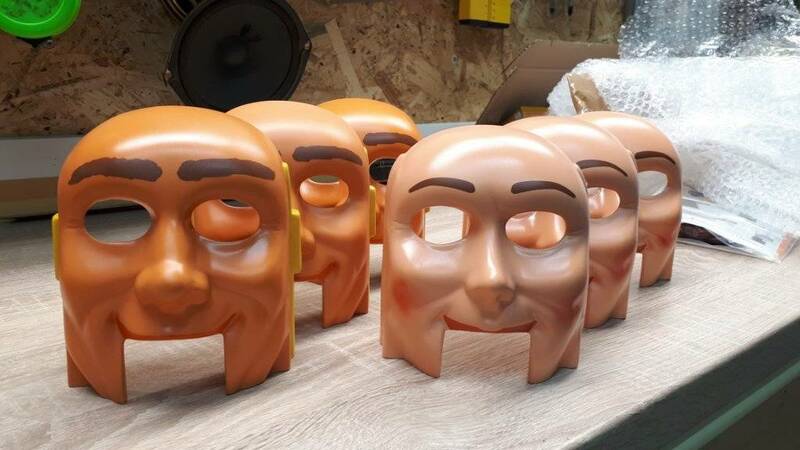 What do you plan to use to clean the faces and hats. I start with some simple green, then am real careful with magic eraser and 91% alcohol for any stubborn scuffs. 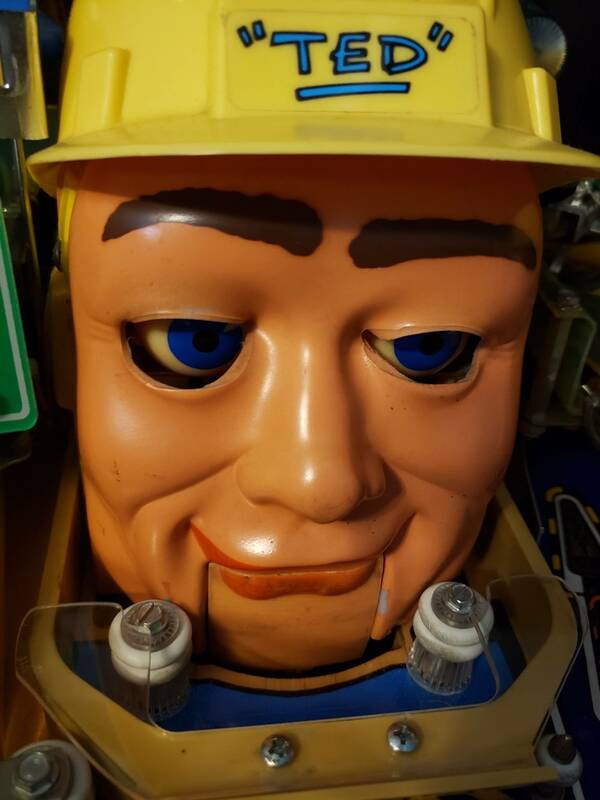 Anyone ever re-paint the lips? Both my red and ted have lost all their paint long, long ago. Was wondering what people used and what holds up. 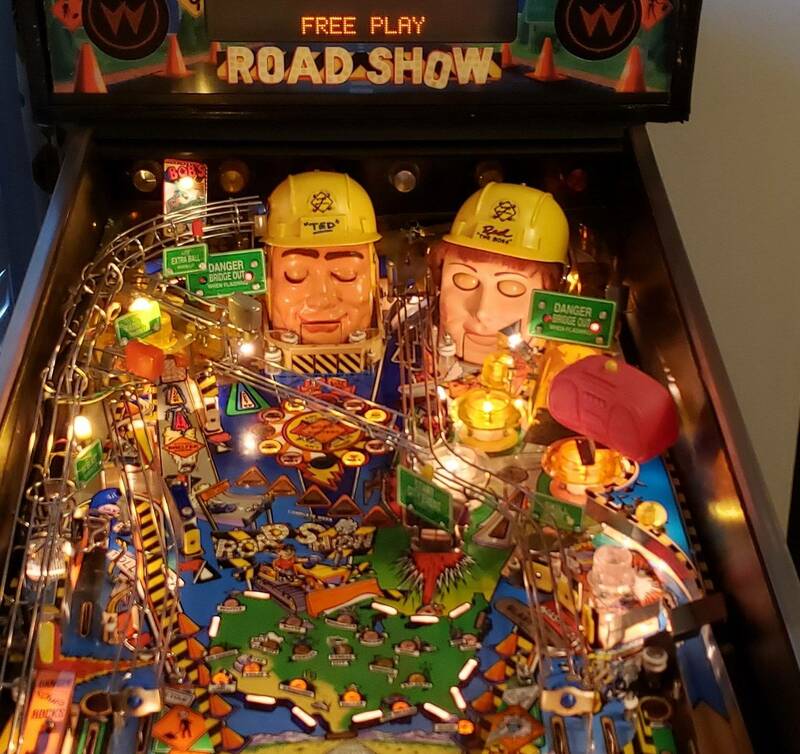 Something something right of passage in the pinball hobby? The joy in rebuilding not one, but two heads. Red is pretty easy to pull out, but for Ted, you have to remove the wireforms and ramps. It wasn't too bad, took me 35 minutes taking pictures along the way. I'll say it was definitely worth it as the playfield is all accessible after that, my game was pretty dirty! Also, just the very top had some light corrosion on it, salt? New parts from Marco are on the way! We used acrylic paint with a brush and some clear coat at the end on mine...came out pretty "neat"
Flexible automotive paint, matte clear coat, same for jaw. Red looks unreal, great work! Still possible to find new decals? I did a small amount of research and it sounds like some of the repros were of poor quality? 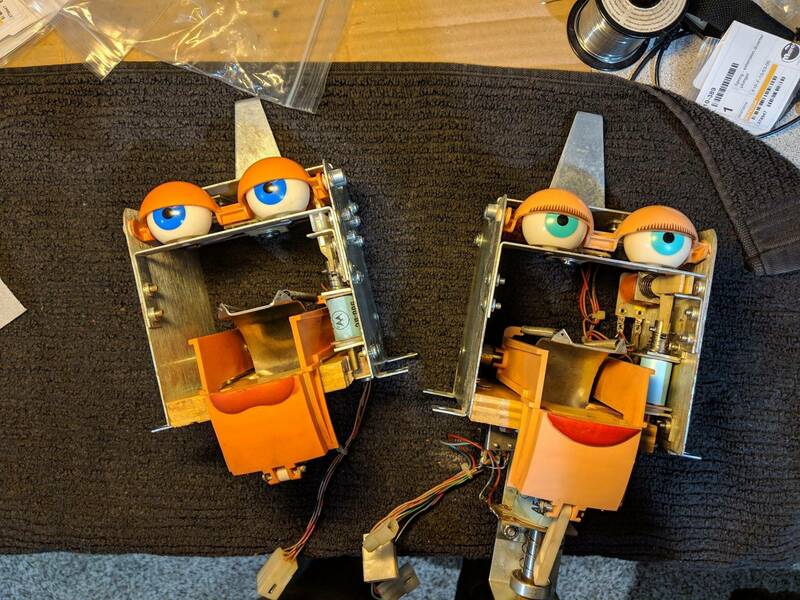 Aaand the heads are rebuilt. For both heads, probably about 3 hours. Worth it knowing they'll be fine forever now. It was also worth it as I was able to clean under the ramps and wireforms, the rest of the game is clean! @soren I have been thinking about the code for Roadshow, would it be possible to make the dozer hits in the taxi mode to advance multi ball days? would it also be possible to have both modes and multi ball running at the same time? Thanks for the interest. No plans to tweak rules or scoring like that. The major goal was to have the mode playable in a more diverse seqence from game to game. I just joined the club last week. 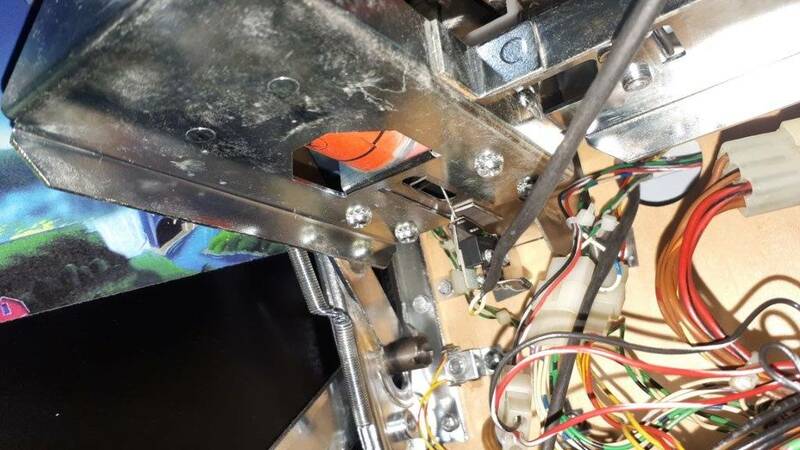 My game has a hole for a center post just below the "Shoot Again" insert. It's obviously factory since the artwork goes around it. Is this an early/sample playfield? Mine has that, too. I think the first run has these holes as it was planed to add a post there as far as I know. Maybe it would add something to the game placing a post there? I think adding a center post would make the game too easy. It's already a pretty long ball time game. I wonder if the early playfields have any other differences. common on games destined for europe. They required it for a while. Was your game reimported? if not it was likely planned for export but then got moved to a USA game. You can see that it was installed at one point. ClarkKent is in Austria, so that makes sense. I don't think my game is a re-import. The sticker on the back says 120v. It does have a new coin door, though, so maybe I'm wrong. then maybe it just has an overrun export playfield in it. Mine came with the post installed. Didn’t know people didn’t have that. Feels like it was meant to have it in play but hey, I haven’t played with out it. Maybe that’s how they came in Australia. The cost of a play here is slightly more than the US. Probably because the machines are more with freight and tax. Standard play in the 90s was $1 a game, $2 for 3 games. A beer was about $1.30 for conversion, a house was about 130,000 beers and a car was about 8000 beers. 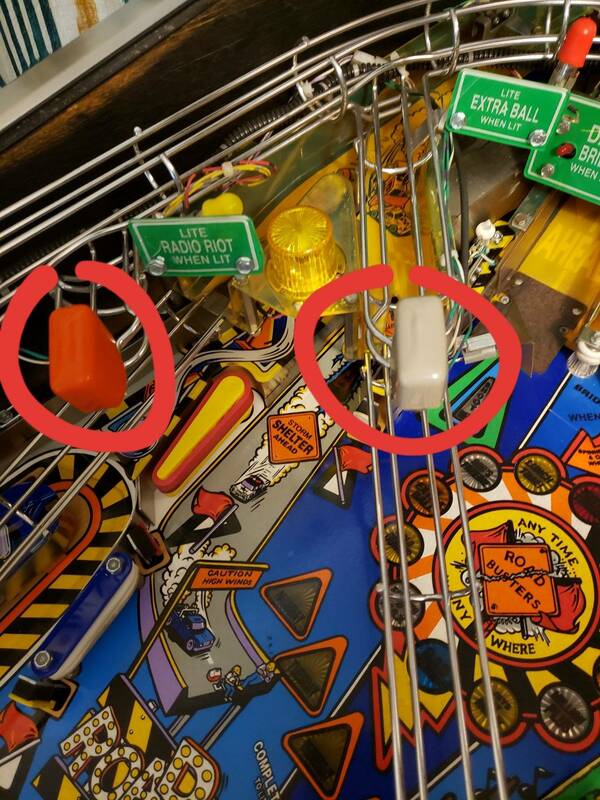 Do y'all know what these rubber caps are called and where I can find them? And what the original colors were? But I have to admit, made me curious. I have only seen 3 RS total (in person), and they all had that hole in the center. Is there any real info out there why some would have it and some not? Never heard about European games needing it.... but now that you guys mention it, I do seem to recall that every game I played as a kid and teen, did have a post there. I forget the sizes on RS, but they are vinyl switch covers. I believe the OG was gray. The Road Show mod has passed the shake down test, and is now installed in an operated game in town. Please review these three design suggestions (A, B and C) for the new 17 cities completed celebration light show. And tell me what you think. Maybe you should add a poll. Definitely the B version, it looks very nice. Looking forward to play the final version. I vote for B version. Thank you for your code improvements. Mine has a hole there too. Don’t believe it’s anything special to our machines. It almost sounds like more games have a hole than don't. Could someone please provide a picture of the Wednesday screen from the Color DMD? Need it for a project. Thanks! Picked up a Road Show yesterday. I'm pretty excited about finding this game. Will look good next to my TZ. Couple Issues I could use some guidance on. Fairly new to the hobby so don't know where to start. 1. I replaced the batteries on the board. Appears to be no evidence of a prior leak. 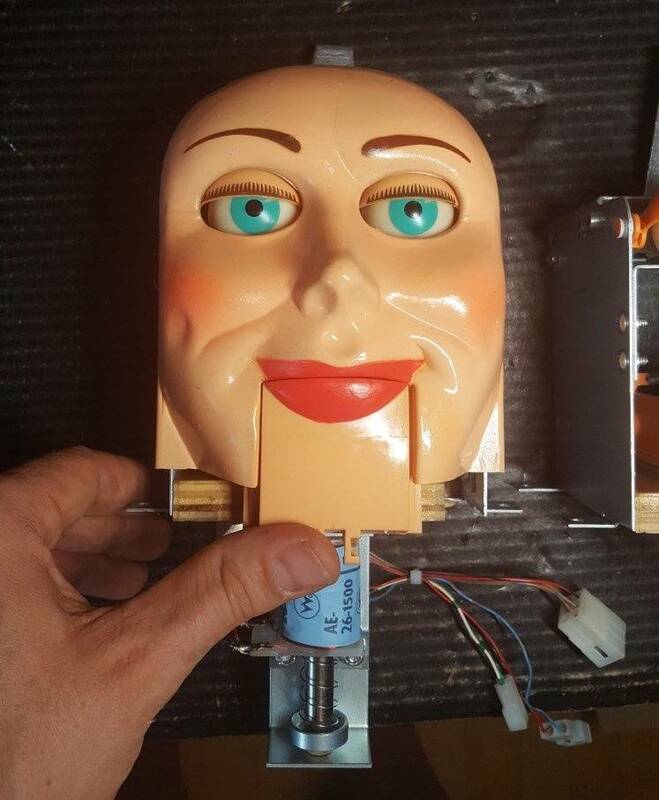 This obviously restored the machine to the factory settings. The issue I am having, when I start the game up and start ball 1 - The game immediately goes into OVERTIME mode and flashes non stop and it appears the score keeps climbing and climbing when I am not even doing anything. If I keep playing it sometimes stops and then plays normal? Any Idea? Now it didn't do this when I tested it out on location. Only once the factory reset happened. 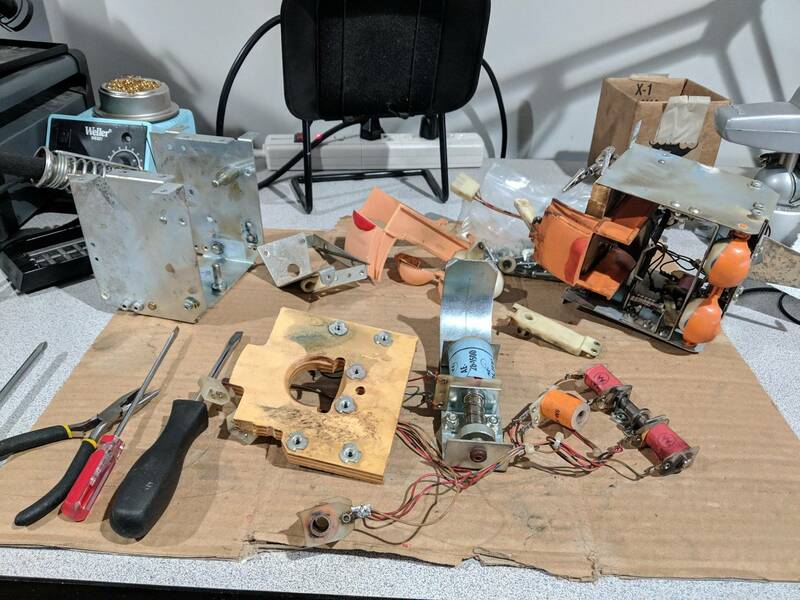 I have some cleaning to do, and quite a few plastics are broke, and the plunger can use a new spring. 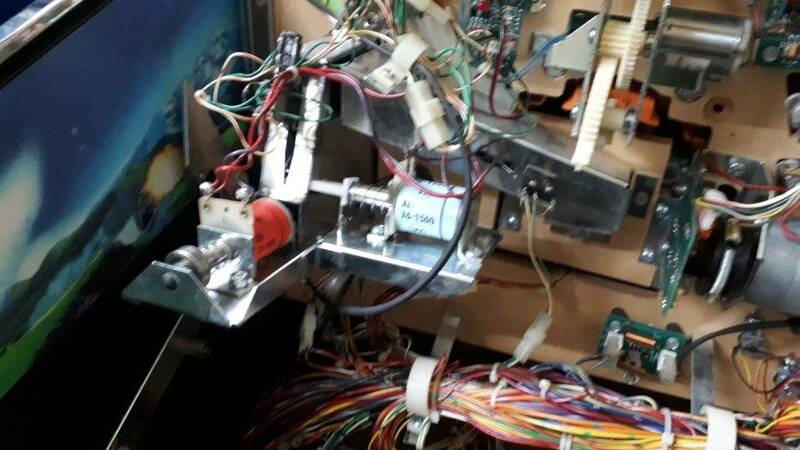 The problem #1 is the trimmer on small board under the playfield. 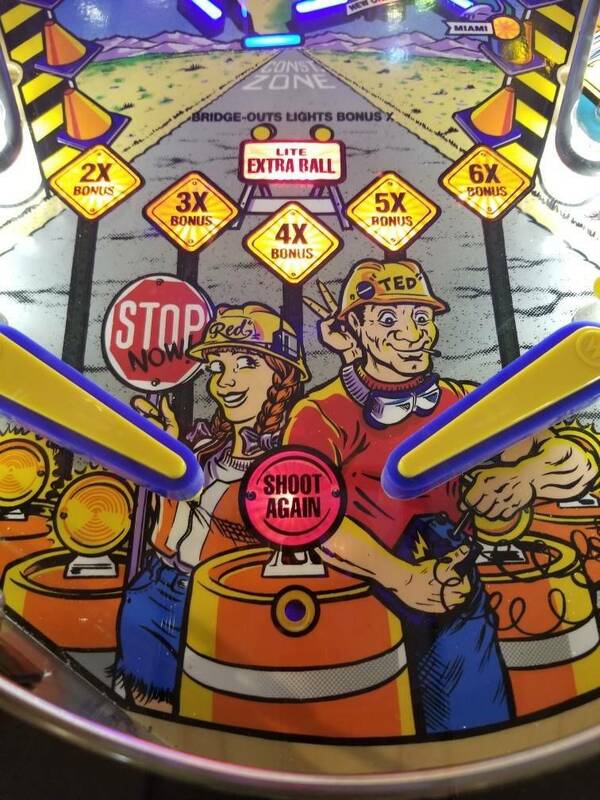 You put the game in switch test mode, lift the playfield and test it with putting a ball in front of the dozer blade. 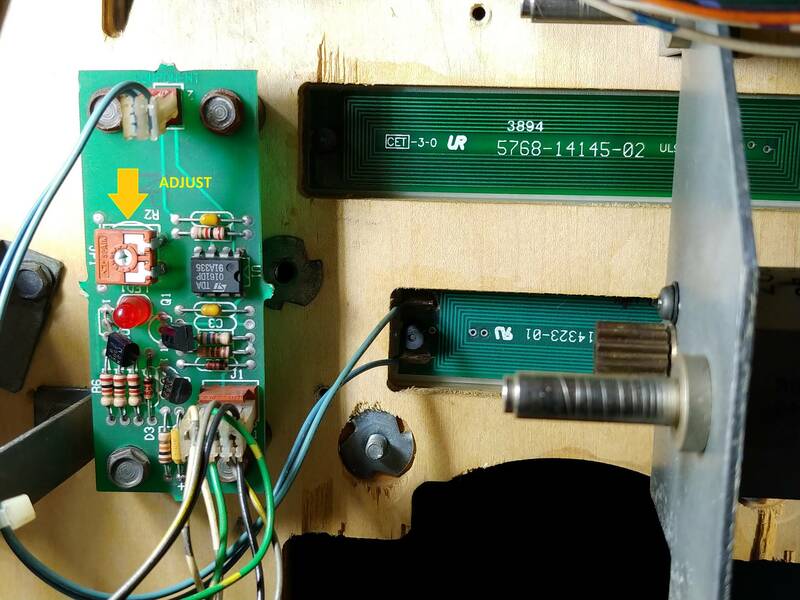 The led on the small board should be off and eddy sensor should sense the ball. The problem #2 is in one of the two switches, probably the lower one. 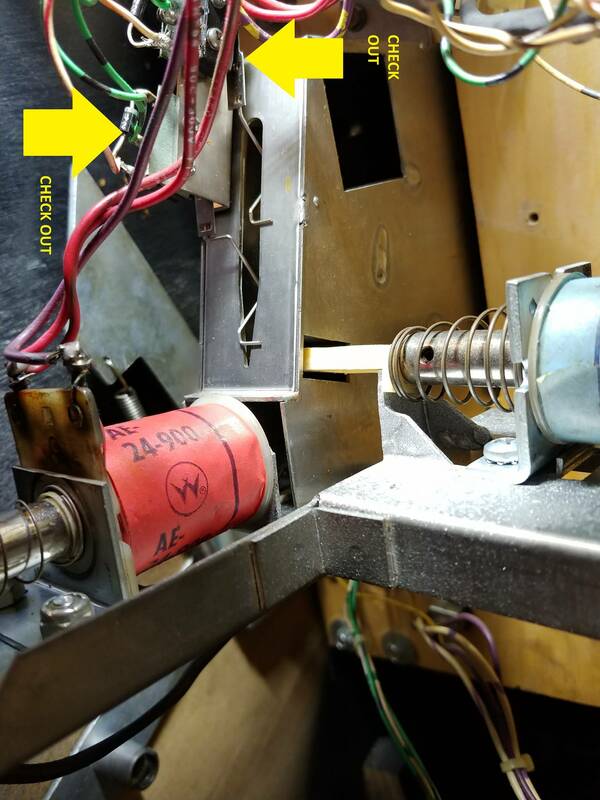 Might be also a switch under the red VUK coil. You were right on the money. I adjusted the Eddy boards and the has resolved the dozer hits not registering. 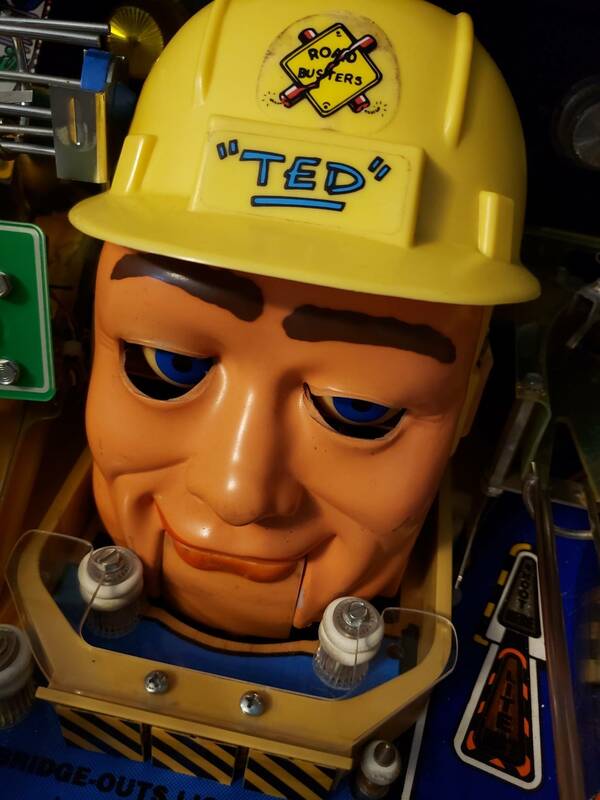 I also addressed the switch under TED's mouth. The switch was very weak, it did however register in test mode. I removed the switch and got it working right again, installed and adjusted it so it didn't bind and bam both problems fixed!!!! My dozer eddy board often goes out of adjustment. 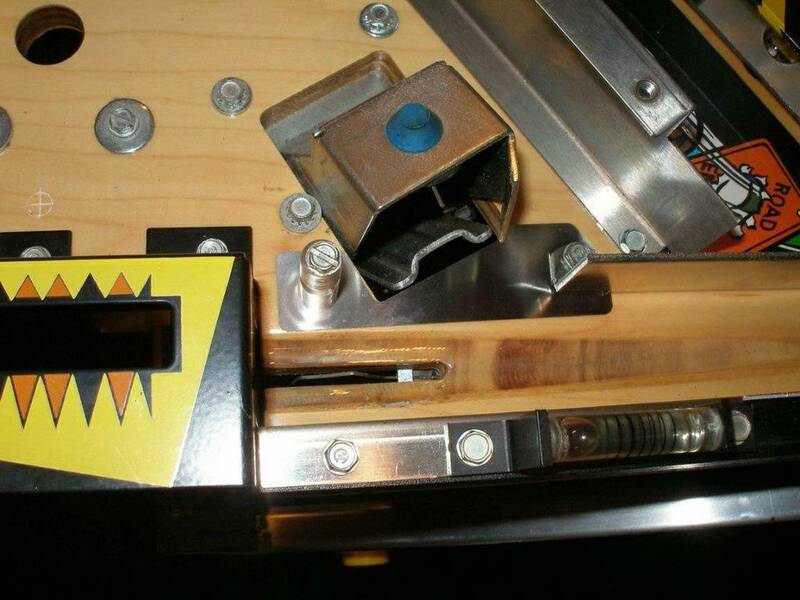 Is there a cheaper way to fix it than buying the improved eddy board? Yes. You can replace the trimmer. I have done it on mine and I ve had no problems for three years now. If you want even more permanent solution you can seal its position with super glue after calibration. The cost of the trimmer should be approximatelly $1-$2. I am really enjoying this game since I picked it up, but I need to sell it so I can afford the next Lawlor masterpiece. If anyone in TX is interested, let me know or check out my ad. I'm skeptical of these WMS Eddy boards. The ones on my ToM would go out of calibration often. I had a bad transistor on one causing fuses to blow. I stuck the auto eddy board on the dozer to have the most sensitivity. Be sure when adjusting the trimmer you use a plastic screwdriver.